We are making five years this year. While we started to exist in 2012 when a call for applications from Ugandan young writers was made, our first workshop took place in 2013, the pioneer mentoring cohort underwent tutelage in 2013, we published our first anthology in June 2013, we started to tour high schools in July 2013 and the inaugural festival was held in August 2013 where the first winner of our short story prize was announced. Since then, every year, we have held creative writing workshops for emerging writers, conducted online mentoring, published annual anthologies, toured high schools with writers and awarded an annual short story prize at our annual festival. In these five years, we have grown in several ways. We have opened the programme to African writers based anywhere on the continent, we have included writers who work in French, we have started a prize for creative non fiction and many other changes. We have succeeded and failed in our endeavours. Our fifth anniversary is a celebration of the triumphs of the foundational years. It is a celebration of friendships, partnerships, voluntarism, goodwill, courage and resilience. We started the year with an online mentoring programme, a call for entries for our two prizes, fiction and non fiction and for the ICAPA – Writivism scriptwriting residency (deadline is March 31). We will publish the year’s edition of the annual digital mini anthology in April, in the tradition of Your Heart Will Skip A Beat (Bahati Books 2016) and My Maths Teacher Hates Me (Jalada 2015). Details will be announced soon. 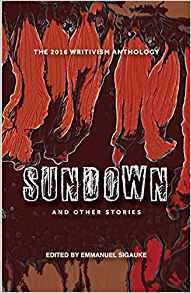 In May, we will release Sundown, the 2016 annual Writivism anthology (in print and as an eBook) in the tradition of Picture Frames (2013), Fire in the Night (2014) and Roses for Betty (2015). This edition will be special and announce a new era in Writivism publishing. Details will be announced soon. To celebrate the 5th anniversary, we are returning to the premise of our first year of existence. With the collaboration of Bristol University, we shall hold two creative writing workshops in Kampala and Gulu, exclusive to young Ugandan writers, which shall be followed by online mentoring and publication of a special anniversary anthology. The workshops will be held in July. Our annual festival will be held from August 17, until August 20, 2017. The festival will be preceded by school visits in the same month. Our theme for 2017 is Reinventing the future. For a very long time, we have been told, irrespective of how old one is, that we are the future. For all of us, the future has come. We are in the future. This year, as we look back at our roots and recent history as an initiative, we would like to gather around the question of the future. We are in the future. How are we reinventing it? Is our future that foretold by the United Nations’ Millennium Development Goals? Is it the apocalyptic prediction by some religious cults and carried out through at least one known suicide mass killing? How are Africans reinventing the future? Join us in answering these questions through various artistic interventions. Mark these dates and let us celebrate our present, past and the future that has come and that yet to come.